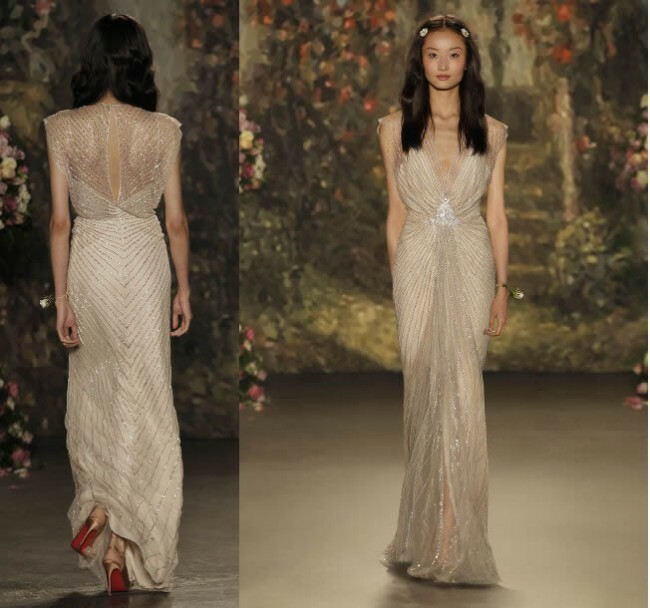 THE STORY: Jenny Packham’s ‘LILYA’ wedding gown is quintessentially art deco inspired and a beautiful and romantic alternative to a traditional wedding dress. I was looking for something different for my day and fell in love with this piece. It has all-over sequin embroidery and features a beautiful deep v neckline with broach detail at the natural waist and a sensual slit on the skirt. A flawless sheath gown with unique and cascading beading. SIZE: UK 12 (AU 10 after alterations). CONDITION: used and altered slightly to have cups put in and slightly taken in and shortened (I am 165cm tall / 5'5") and it still had enough length in it for heels. Please note - because it has been worn, and is a delicate piece, there are a few strands of beading that came loose. This has been fixed and hardly noticeable. SHIPPING: Able to ship anywhere in the world via DHL. Additional Fees Apply. Our wedding was in October this year - haven't received our photos yet which is why I don't have any up of the day but Please don’t hesitate to get in touch for further information/questions/photos (Which I will hopefully have soon)!